Herewith the second part of the newsletter.. 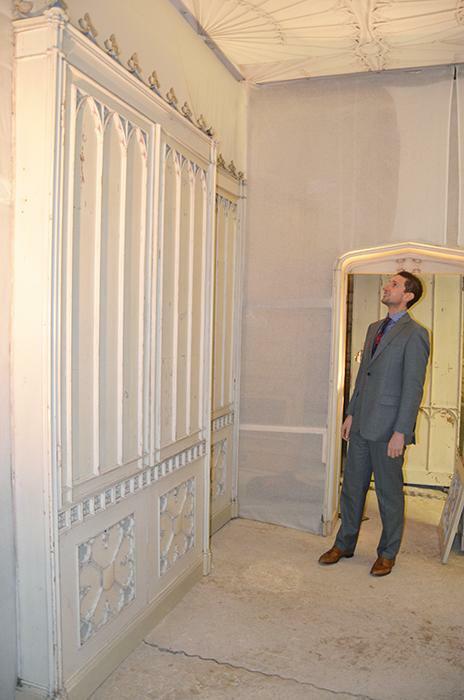 The first lecture by Prof. Peter Lindfield looked closely at our James Wyatt room, its connection to Wyatt's other works, notably the ill-fated gothic fantasy Fonthill Abbey, and Lee Priory's singular relationship to Horace Walpole's Strawberry Hill - a parent and child relationship if ever there was one! I know Peter's research is ongoing and with more to say I will leave this here for now. After lunch and a good look around, seeing the room set up as if at Lee (we discovered it to be a half cube), restorer and all round plaster expert Philip Gashes talked us through the restoration project at Strawberry Hill and his approach and resolution to the restoration challenge that was the Lee Priory Ceiling . Four sections taken down in wooden cradles (which we kept) came together again for the first time in 60 years, with a little know-how and no shortage of skilled craftsmanship, we learnt how the work was planned, set out and executed - a true insight into the plasterer's art. Prof. Mark Baker up next talking us through a history of Welsh buildings in the North of Wales and how they and their owners looked out to the opportunities of commerce with England, whilst simultaneously looking inwards and back, with their Welsh cultural identity held firmly in the vernacular of the past. This harking back to an earlier style was exemplified when comparing the two staircases in our collection, both dating from 1660, Crakemarsh Hall all swags and baroque scrolls juxtaposed against New Hall all solid, ancient and dominant. To sum up - A really interesting day with much knowledge imparted and exchanged, good company and the finding of my new favourite word - Gloomth - best described as a kind of Warpolian Gothik half-light. 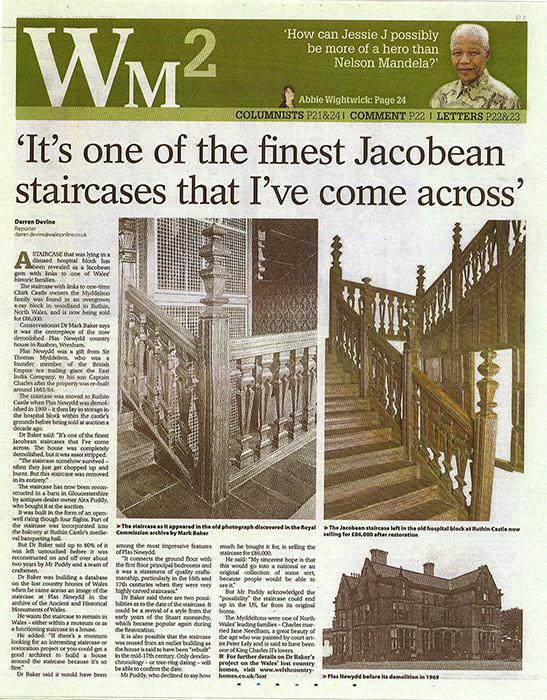 Through Mark's research the Oak staircase found in the outhouse of Ruthin Castle can now be securely provenanced to New Hall Ruabon. 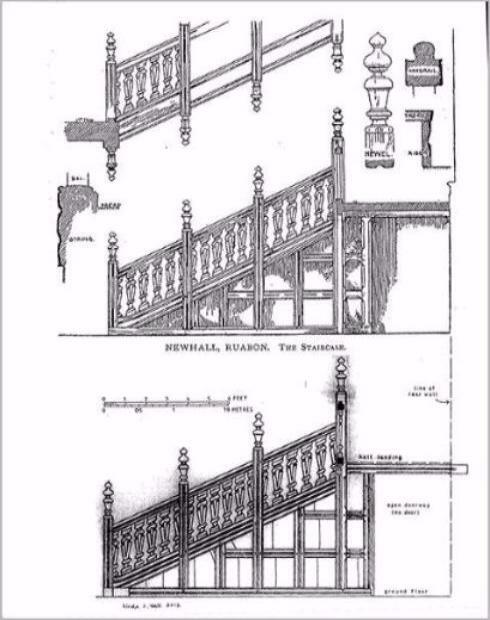 This firm attribution can be no more clearly shown than by comparing the drawing made of the stair shortly before it was dismantled in 1969 and the drawing by the well-known Architectural Historian Linda Hall in 2012 (my thanks to Linda for all her help with this project). This historic discovery sparked media interest and precipitated the resulting article in The Western Mail, as well as chat on social media, however I, as a Luddite, unfortunately missed all that re-tweeting etc. There must be something Gothik in the air as we have just delivered back to Strawberry Hill the re-furbished Shell Seat. 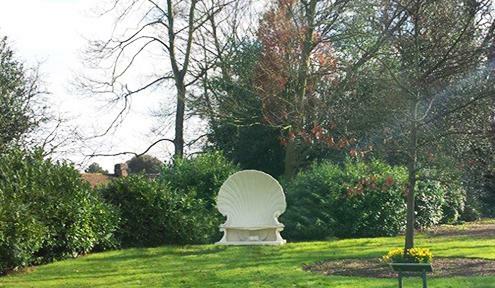 After researching and developing (from a rather fanciful drawing I might add), and then producing and selling on behalf of The Strawberry Hill Trust, I am pleased to announce that we have now sold the Shell Seat, intellectual property rights and corresponding know-how, to the Trust. 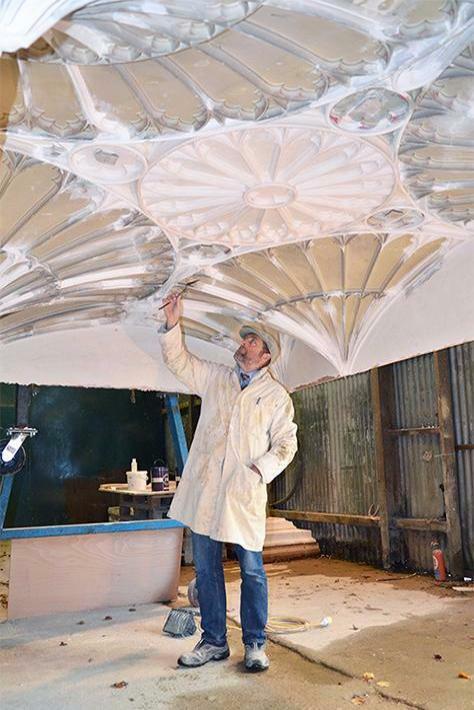 This will allow the Trust to make the Shell Seat themselves and so please in future contact the Trust at Strawberry Hill direct with all enquiries regarding this most splendid of creations. 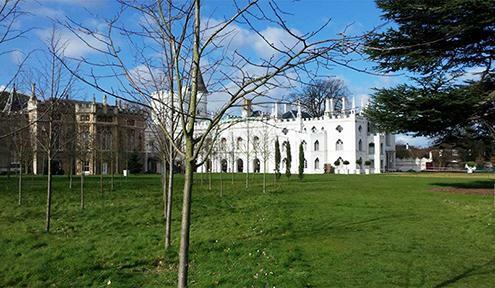 Should you wish to see the Shell Seat in-situ and of course visit Horace Walpole's Strawberry Hill, please click on the Shell Seat image below and this will take you directly to their web site. 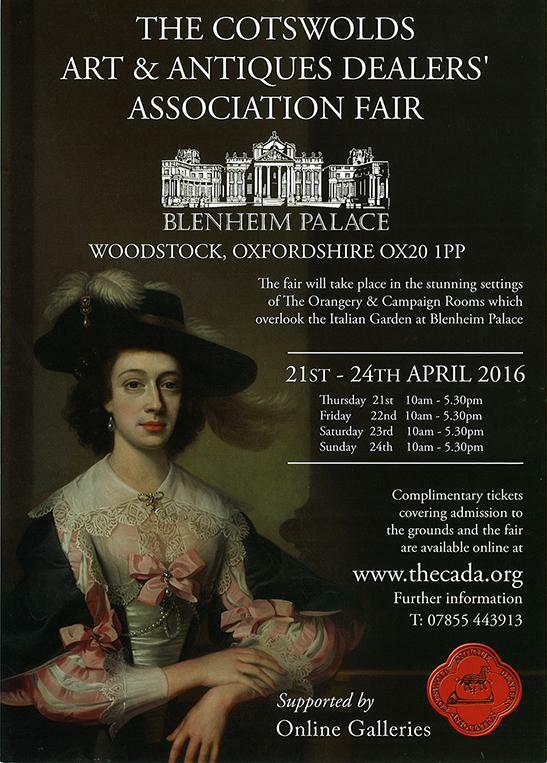 Another year flown by and our annual outing to Blenheim Palace with The Cotswold Antique Dealers' Association will commence once more in April. 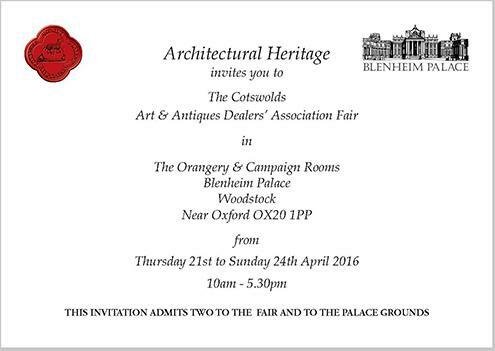 This boutique fair has a high concentration of some of the best dealers in their field, exhibiting across a wide range of disciplines - please see below an e-ticket - just print off and this will allow you and a friend/significant other free access to the Antiques Fair and Palace Grounds, plus a discounted entry to the Palace - well worth a visit. Thank you as ever for your interest.